Combat sports streaming service DAZN has reportedly inked a short-term deal with the highest-profile boxing free agent on the market. Mike Coppinger of Ring Magazine first reported that Matchroom Boxing’s Eddie Hearn and DAZN chairman John Skipper met with “GGG” in Los Angeles on Wednesday. The goal of the meeting was to finalize terms of a contract that would be for two fights. Both would earn him six-figure paydays. Golovkin is a former unified middleweight champion. He is coming off a narrow majority decision loss to Canelo Alvarez last September. The year before, he suffered a far more controversial split draw to the same opponent. “GGG” did defeat Vanes Martirosyan in May of 2018 via KO in lieu of Canelo’s failed drug test. DAZN has quickly become the marquee destination for boxing talent. The service boasts the fighting rights to Canelo Alvarez, unified heavyweight champion Anthony Joshua, undisputed cruiserweight champion Oleksandr Usyk, and WBC super-flyweight champ Srisaket Sor Rungvisai, just to name a few. 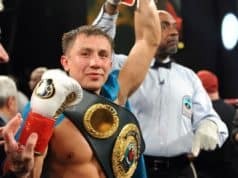 Should Golovkin sign with DAZN a trilogy fight with Canelo would only make sense. 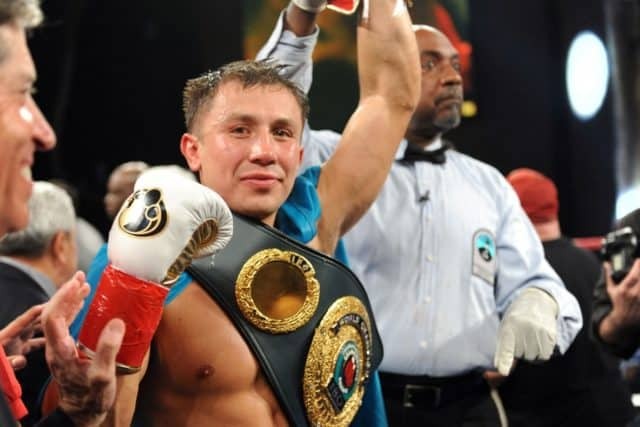 However, being that “GGG’s” reported deal essentially equates to a one-year contract, matchmakers better get a move on.